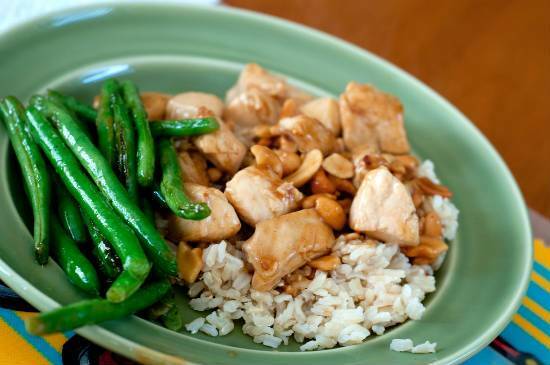 A classic Chinese stir-fry dish with chicken breast, cashew nuts and light soy sauce. Easy to make and tastes delicious with rice and steamed vegetables. 1. Combine the egg white, sesame oil, corn flour and a pinch of salt in a bowl. 3. Keep it in the fridge for 10 to 15 minutes. 4. Heat sesame oil in a pan over medium flame. 5. Add the chicken and stir-fry for a minute or two. Ensure the chicken does not stick to the pan. 6. Remove the chicken pieces from the pan and drain excess oil. 7. Heat water in a pan over medium flame. 8. When it starts to boil, add the chicken pieces and cook for 2 to 4 minutes. Drain well. 9. Heat groundnut oil in a pan. 10. Fry the cashew nuts for 45 seconds to a minute. 11. Add the wine, red capsicum, soy sauce and chicken. 12. Stir-fry for 2 to 3 minutes. Feel free to comment or share your thoughts on this Cashew Chicken Recipe from Awesome Cuisine.